Image: JUN2/Getty Images, ribeiroantonio/Getty Images, Akepong Srichaichana/Getty Images. Design: Kenzie Mastroe/SheKnows. There are five tastes chefs work with in order to create balance in their dishes: sweet, salty, sour, bitter and umami (aka savory). And while we’re big fans of all of them, we can’t help but favor one perhaps a hint more than the others — sour! We’re in luck too. Where flavor is concerned, 2019 is poised to be a year dominated by sour food trends. With Korean, Filipino and Persian cuisines gaining influence in the American culinary world, tartness will take a much more prominent place on menus. And you know what? We’re not mad about it — not even a little. So prepare your pucker, because the following six food trends will be popping up everywhere in the new year. We know — this sounds like a strange amalgamation. But like its cousin, apple cider vinegar, coconut vinegar has the kind of health-boosting benefits that create a lot of buzz. It’s packed with amino acids, vitamins B and C, fiber and naturally occurring FOS (a prebiotic great for digestive health). Accordingly, coconut vinegar can help with everything from digestive issues to balancing blood sugar. To try out this sour trend, add a tablespoon of coconut vinegar to oil or mustard to make a creamy, zingy salad dressing. You can also simply sip it as a tonic by mixing a tablespoon into a glass of water with a drop of raw honey (drinking it straight can cause damage to your esophagus). Taste-wise, some say coconut vinegar is slightly sweeter than apple cider vinegar. But bottom line? They both taste like vinegar. With the popularity of Korean and Korean-fusion restaurants on the rise in America, it’s no surprise the national dish of the country, kimchi, is popping up more and more in restaurant dishes. So, what is kimchi? Derived from the Korean word shimchae, which means “salting of vegetables,” kimchi is basically sour-and-spicy fermented veggies. Like most fermented foods, it’s nutrient-dense, with vitamins A and B1 and antioxidants, and it contains probiotics that promote healthy digestion. 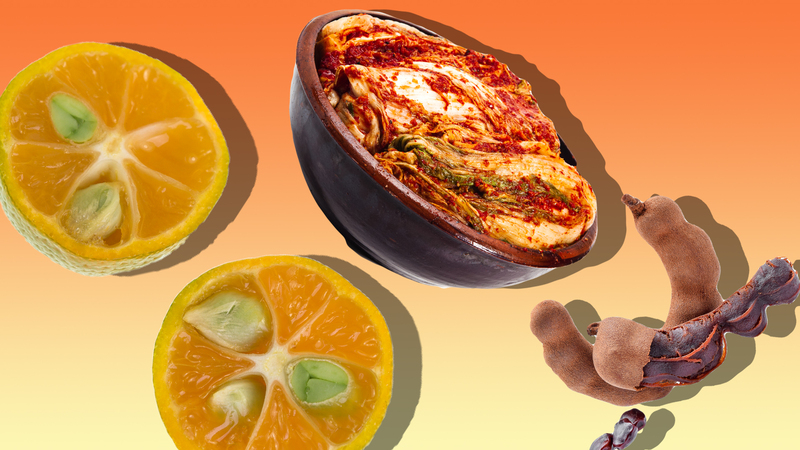 Happily, kimchi can be incorporated into just about anything. You can serve it as a sort of condiment, like relish, or you can make it part of your meal. Restaurants are serving up kimchi Mexican fare (think kimchi tacos), kimchi mac and cheese and even kimchi ice cream. At home, you can ease into it by adding it to rice dishes and savory pancakes or use it to top rice cakes and burger patties. You can also stir it into soups or stews. The sky’s the limit, really. The popularity of pickles and pickle-flavored foods really had a moment in 2018, and that trend doesn’t look like it’s going anywhere in 2019. Of course, we all know what pickles are, right? They’re cucumbers that have been brined in vinegar and spices until they’ll make your pout pucker. If you aren’t ready to try some of this trend’s wilder items — think pickle-flavored slushies from Sonic or pickle-flavored vodka — don’t fret. There are plenty of other, more subtle ways to incorporate pickles into your meal planning. Bare Feet in the Kitchen has a killer recipe for dill pickle soup, for example. Spend With Pennies will clue you in on how to make a four-ingredient dill pickle dip. Take Two Tapas’ Cuban totchos nachos pair tater tots with pulled pork, cheese and — star ingredient alert — sliced fridge pickles. Disneyland has a pizza topped with pickles, and you can never go wrong with fried pickles either. In 2012, food critic and Food Network star Andrew Zimmern predicted Filipino cuisine would become “the next big thing.” And while that hasn’t fully come to fruition, Filipino dishes are certainly positioned to take over American menus. One such ingredient on the rise is calamansi (also spelled kalamansi). This small, round citrus fruit is found everywhere in the Philippines, explaining their ubiquitousness in native cuisine. There, it is frequently combined with soy sauce, and that mixture is used as a dipping sauce or marinade for other foods. There are several ways you can sample calamansi. If you treat it like any other citrus fruit, you can use it to flavor just about everything: ice cream, pastries, pies, fish tacos, pancit noodles, meats and more. The Little Epicurean recommends turning it into a refreshing fruit juice. Or if you’re feeling adventurous, the Brownsville Herald insists you should just eat them whole — peel and all. Rhubarb Lattice Tart by @sculptedkitchen 💜 RECIPE⬇ · INGREDIENTS (TART) • 3 cups of all purpose flour • 1 cup of cornbread mix (alternatively if you have cornmeal that could do too) • 1 1/2 tsp of baking powder • 2 cups of vegan butter, cold • 1/2 cup of rice malt syrup • Some zest of lemon • Cold water as needed, dropped 1 tsp at a time · INSTRUCTIONS 1. Place all the ingredients in a food processor until it resembles crumbs. Add water, if needed. 2, Place on a floured work surface & knead it gently. I wrapped it up & placed it in the fridge overnight. 3. Preheat the oven to 350. Place your dough in your prepared pan and place some beans or pie weights on top (on top of some sprayed foil). Bake for 8 minutes. Remove from oven and remove the pie weights. Gently fork the bottom of the tart & return tart back to the oven for 10 minutes. · RECIPE (ALMOND FRANGIPANE) • 4 T of vegan butter • 1/2 cup of coconut sugar • 1 1/4 cups ground almonds • 3 T of cornbread mix • 2 T of almond milk Mix together until tart is ready. · RECIPE (RHUBARB LATTICE – inspired by @bakingamoment) 1. Purchase some bright red rhubarb, about an inch in width. 2. Take your mandolin & slice them lengthwise until you have a good collection of strips. 3. Boil 1/2 cup of coconut sugar & 1 cup of water on the stovetop, in a saucepan. 4. Lower the heat to simmer &, working in batches, let the strips cook for a minute or two in the sugar bath. 5. Once cooled, start making your lattice on parchment paper. 💕🤗 · 📸Photo & Recipe by @sculptedkitchen 🌟Tag your photos with @xplore.food and #xplore_food for a chance to be featured! Have you ever seen rhubarb? It appears to be a reddish-purple-hued celery, but its flavor is nothing like the green-stalked savory-food staple. Rhubarb will put you in a pucker — so much so that some people claim it isn’t even palatable. Wondering how it’s a food trend then? The key is how you prepare and use it, and that often means pairing it with something sweet. Rhubarb pie, rhubarb ice cream and rhubarb pastries are all popular picks for this sour ingredient. Not surprisingly, it has also made its way into cocktails, like rhubarb tea at Rutledge Cab Co. in Charleston, South Carolina. Need even more rhubarb inspiration? The Washington Rhubarb Growers Association offers instructions for making a slew of tasty rhubarb-infused dishes. A podlike fruit that grows mainly in tropical climates, tamarind has a trademark tart flavor. In recent years, it has seen its menu mentions rise in the U.S. It has long been a staple in Indian, Latin American and Southeast Asian cooking, where it is popular in sauce, drink and candy form. If you’re ready to experiment with this oft-overlooked ingredient, you have plenty of options. You can use the unripe pods during cooking to season meat, fish or rice. You can combine the pulp with sugar to make candy. Tamarind can also be used in beverages, jams and practically anything else you can think of.